• the Russian Science Citation Index. The Journal of Foreign Legislation and Comparative Law is oriented to scientists and practitioners who are dealing with problems of legal regulation. • ​​​​​​​consolidation of efforts of the scientific community in solving legal problems related to the processes of integration, globalization and effective interaction of states. The Journal publishes the results of Russian and foreign doctrinal researches reflecting the main trends in the development of legislative branches, experience that served as a starting point for synthesizing the new ideas and discoveries in the field of law. Preference is given to articles which combine theory and practice, contain analytical materials, constructive proposals on the most effective ways and methods of legal regulation. The Journal welcomes interdisciplinary research which contributes to the achievement of its goals, provides a discussion platform for representatives of not only different scientific views, but also different sciences and scientific schools. The content of articles and publications of the Journal of leading scientists, prominent political and public figures of Russia, France, Germany, Finland, Switzerland and other countries attract the attention of readers. The Journal also publishes articles of representatives of international organizations - Financial Action Task Force on Money Laundering (FATF), the International Anti-Corruption Academy, the European Commission for Democracy through Law of the Council of Europe (Venice Commission) and others. 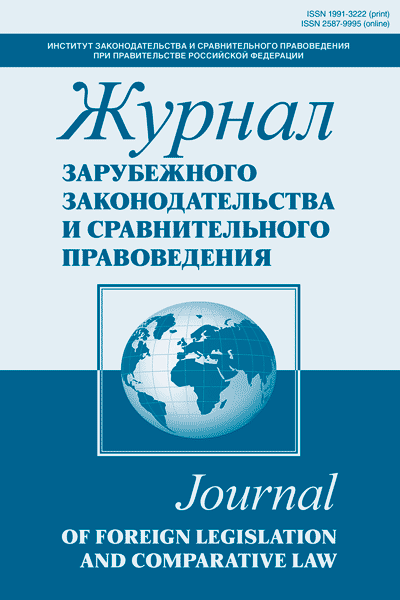 The materials of the Journal give impetus to new large-scale comparative-legal research and legislative works; the combination of the scientific traditions of the Institute of Legislation and Comparative Law under the Government of the Russian Federation and the innovations of the Journal of Foreign Legislation and Comparative Law ensures the constant interaction of science and practice, opening up new horizons for development.